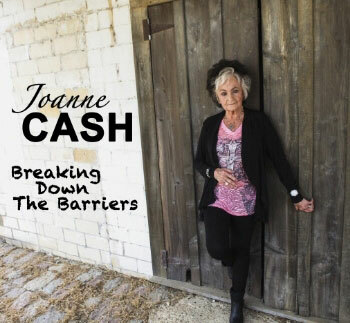 (NASHVILLE, Tennessee) -- Gospel music legend Joanne Cash, sister of country music icon Johnny Cash, will release her latest album, Breaking Down the Barriers, on April 1st. The star-studded duets album from Nashville-based indie label Proverbial Excellence will be available in stores and at all digital retailers including iTunes and Amazon, distributed by Elevate Entertainment and Syntax Distribution. On Breaking Down the Barriers, Joanne teamed up with many of her famous friends for a collection of 14 duets that are firmly planted in Gospel. Fans of the Cash family will be thrilled to find duet’s with Rosanne Cash and Tommy Cash, in addition to contributions from iconic country artists Larry Gatlin, T. Graham Brown, The Fox Brothers, Razzy Bailey, George Hamilton IV and Riders in the Sky’s Ranger Doug and Christian rockers Kevin Max (dcTalk, Audio Adrenaline), Dan Haseltine (Jars of Clay), Rick Florian (Whiteheart) and John Schlitt (Petra). Country music fans will take particular interest in two tracks on the new album, due to their historical significance. The lyrics for the Tommy Cash duet, “My Lord Has Gone,” were written by Joanne and Tommy’s brother Johnny Cash, who passed away before he had the chance to record it. On the song “On The Rock Where Moses Stood,” Joanne duets with legendary country artist George Hamilton IV, in what turned out to be his final recording. Hamilton died unexpectedly in September. "These sessions, often done in Joanne's home, pair Joanne with artists from all walks of life and genres,” says producer Chad Randall Crow. "Each of these songs was hand-picked for this inspirational work. Like her brother's American Recordings sessions, these performances will stand the test of time." Joanne grew up in Dyess, Arkansas, where some of her earliest Cash family memories include singing spiritual standards in the cotton fields and laying on the living room floor listening to gospel and country music - scenes that would eventually be played out in the box office smash, I Walk the Line. Joanne found a musical calling in the 1970s while working at House of Cash, Johnny's famed recording studio, office space and musical museum. She sang at the Grand Ole Opry from 1972-1976 with Jimmy Rodgers Snow's Grand Ole Gospel Time. During that era, Joanne met her husband Dr. Harry Yates, and the couple soon dedicated themselves to full time music ministry, traveling the country for fifteen years of full time preaching and singing the gospel. When they came off the road in 1990, the couple founded Nashville Cowboy Church, where Joanne continues to sing every Sunday. In addition, Joanne continues to tour worldwide, and hosts a Tuesday night residency at the Wyndham Vacation Resort in Nashville, where she shares a variety of original and gospel/country covers, plus tidbits of the Cash family testimony. For more info on John Schlitt visit the JFH Artists Database.